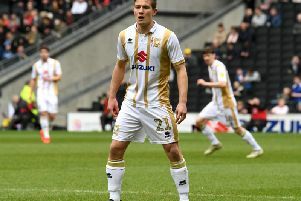 Player ratings in MK Dons' 4-3 win over Oxford United on Tuesday night. Wieger Sietsma - 7 - Though he let in three, he made a string of excellent stops early on and nearly saved a penalty. A strong showing. George Williams - 6 - Had a pretty quiet night, with most of Oxford's attacks coming down the opposite flank. Dean Lewington - 5 - Enjoyed a good nip-and-tuck night against Rob Hall, but allowed him to cut inside to score and gave away a penalty. Scott Wootton - 5 - Won't be happy with his performance after slipping to allow the first, and probably should have seen red for a petulant challenge on Hall. Ethan Ebanks-Landell - 6 - Probably the strongest link in the defence. Ed Upson - 8 - Played as the sole central player, and took control of the game. Everything went through him. Aidan Nesbitt - 6 - Started well but faded in the second half. Brandon Thomas-Asante - 7 - Opened the scoring with a well-worked effort, and impressed throughout. Robbie Muirhead - 5 - Almost the forgotten man of the game as he barely saw the ball. But could have wrapped it up even more when he hit the post with the final kick of the game. Gboly Ariyibi - 8 - An excellent brace just before half time, and terrified his Oxford full back. Ryan Seager - 6 - A fruitless night, by and large, but finished his one chance with aplomb. Peter Pawlett - 7 - An excellent dummy and one-two to set up Seager. Kieran Agard - 6 - Struggled with his first touch again.